Observation - Possible Hypogymnia tubulosa on larch - UK and Ireland. Description: Grey green foliose lichen with large sorediate lobe ends. Two side views of different clubs and a view from below. 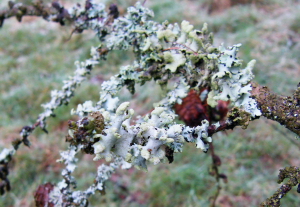 Grey green foliose lichen with large sorediate lobe ends. Two side views of different clubs and a view from below.